Fiat has released a new commercial starring the 2017 124 Spider. 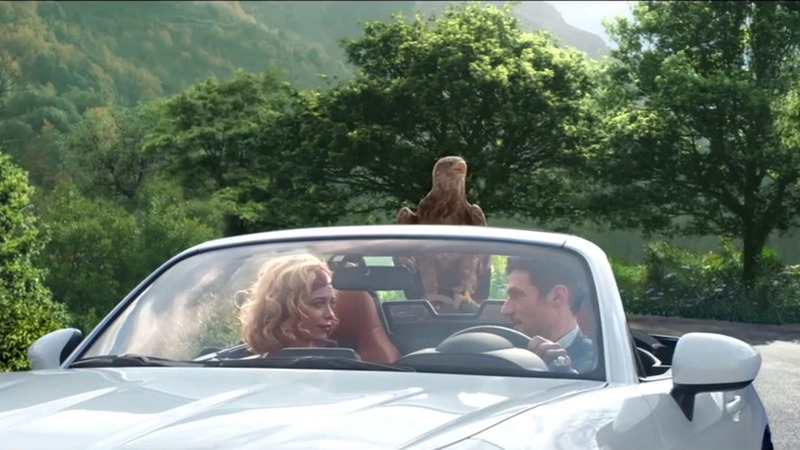 Dubbed "Free Like a Bird," the video features the music of Wyclef Jean and shows the Mazda MX-5 based roadster being followed by an eagle. The car eventually comes to a stop and the eagle lands on the trunk as the announcer says "We all want to be as free as the birds but maybe the birds want to be as free as us." The eagle then goes for a ride as the ad says the 124 Spider is "more fun than flying." In order to promote the clip, Fiat released two other videos including a behind-the-scenes look at the creation of the ad and a 360° experience which enables viewers to get a "bird’s-eye view of the 124 Spider driving down the southern coast of Italy. The Fiat 124 Spider will go on sale in the United States this summer with a turbocharged 1.4-liter four-cylinder engine that develops 160 horsepower and 184 pound-feet of torque. It can be connected to either a six-speed manual or an optional six-speed automatic gearbox. Buyers looking for something sportier can hold out for the 124 Spider Elaborazione Abarth which features a unique front fascia, a sport-tuned suspension, and a limited slip rear differential.